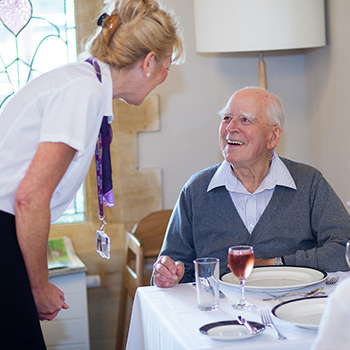 The dining experience at Moore Place care home is truly superb. The staff in our care home are committed to making mealtimes a sociable and pleasurable part of each day, and with ambient dining areas on every floor you don’t need to go far at all to enjoy mealtimes at Moore Place. Our highly skilled chefs use seasonal ingredients to create appetising, freshly cooked and nutritionally balanced food with a different choice every day, meaning a delicious care home menu. Residents are consulted by our chefs on a regular basis to ensure the catering team get to know and understand food preferences, as well as individual nutritional requirements, are able to ensure people with specific dietary needs have the correct foods offered to them and all residents enjoy the meals served. We understand the importance of ambience and ensure that our dining room décor helps to stimulate appetite and creates an enjoyable atmosphere. We also recognise that mealtimes are a great opportunity for social interaction and involvement. At Moore Place visitors are welcome at any time and can join you at mealtimes. There are also many opportunities for residents to cook and prepare meals so that they can feel part of the running of their home and can carry our familiar activities. To get a taste of the food on offer download a sample Moore Place menu.